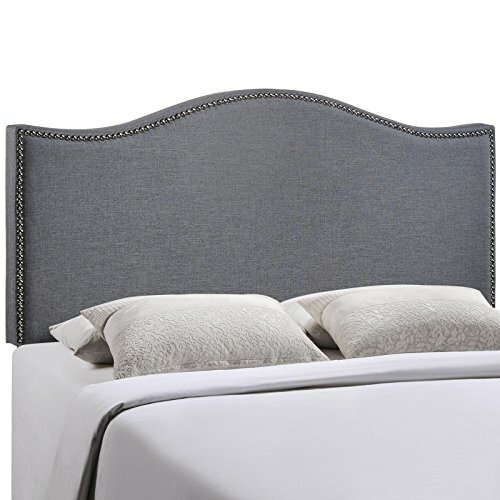 ELEGANT DETAIL - Delicately framed with polished nailhead trim, Curl's elegant details do not go unnoticed, making this headboard a chic, fashionable update to a bedroom. SUPERIOR CONSTRUCTION - Durable and strong, Curl features a solid wood frame that's built to accompany night after night of peaceful rest. The particleboard panel and metal legs bring added sturdiness. QUALITY UPHOLSTERY - Upholstered in fine linen fabric, this headboard's rich texture bestows luxurious appeal to its appearance. Boasting a neutral hue, Curl adds calming relaxation to your home. CURVED SHAPE - Beautifully balancing the sophisticated details that are showcased in this piece, the playful curved shape of Curl artfully develops its trademark look and appeal. MOUNTING POSITIONS - Location A: 25" (Height To Bottom Of Headboard) to 51.5" (Height To Top Of Headboard) Location B: 22.5" to 49" Location C: 20" to 46.5" Location D: 17" to 44"